SeatGeek's engine for predicting ticket pricing in the secondary market attracts a $1 million VC infusion. Geeks: Russ D'Souza, left, and Jack GroeTzinger. SeatGeek was inspired by frustration. Jack Groetzinger and Russ D'Souza, both avid concertgoers and sports enthusiasts, were fed up with the unpredictability of the secondary ticket market--reseller pricing that can swing from significantly higher than face value to cut-rate, depending on an event's popularity. "From a consumer's perspective, it's confusing to know when to buy tickets because you can buy them one day and see prices go to half that price a couple weeks later," Groetzinger says. So in 2009 they founded SeatGeek, a ticket search engine that tracks ticket pricing trends. The duo had previously founded the blogging community Scribnia and also had general business experience: Groetzinger worked as an associate consultant at Boston-based management consulting firm Bain & Co., and D'Souza was an analyst at management consulting firm Monitor Group in Cambridge, Mass. Together, they developed an econometric approach to ticket price prediction that considers factors such as venue, ticket supply and popularity of the performer or team to determine whether prices are likely to head up or down in the secondary market. This helps customers make more accurate decisions about when to buy their tickets, D'Souza says. SeatGeek has grown to forecast ticket prices for more than 10,000 events at any one time, including professional sporting events, concerts and theater performances. It claims an accuracy rate of 80 percent. Last July, Founder Collective and NYC Seed--two early-stage venture firms based in New York City--joined forces to pump a $1 million Series A round into the fledgling forecaster. 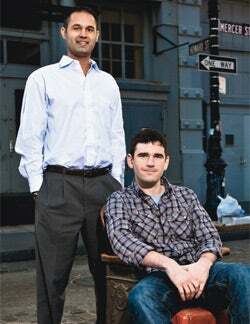 Groetzinger and D'Souza had met the Founder Collective team when they were in the DreamIt Ventures accelerator program, a Philadelphia incubator for startups, before they relocated the company to Manhattan in September 2009. David Frankel, managing partner at Founder, was an investor in GetMeIn.com, a London-based online ticket seller that sold to Ticketmaster in 2008, and he immediately liked SeatGeek and its founders. "Concept is important to me, but I look for the entrepreneur and the people first," Frankel says. "I had a great reaction to Jack and Russ. They're hugely into detail, and I love entrepreneurs who are immersed in the details of the business." SeatGeek gets a cut of sales it refers rather than selling tickets directly, so improving accuracy and growing usage is critical to the company's viability. Groetzinger says SeatGeek will use the investment to add more engineers and marketers to its 12-person staff. The team also plans to expand its forecast offerings into college sports as well as niche sports and will explore other markets. "We started this to be exclusively focused on forecasting and how prices move," Groetzinger says, "but we have broadened our scope into being a ticket search site that uses data to help people find good deals."